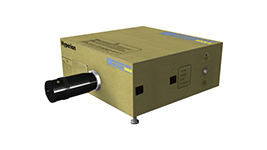 A supremely simple system, rugged and reliable, that provides elegant solutions to common patient complaints about MRI exams. All this leads to happier and more comfortable patients, which means less time lost and fewer incomplete scans for you. 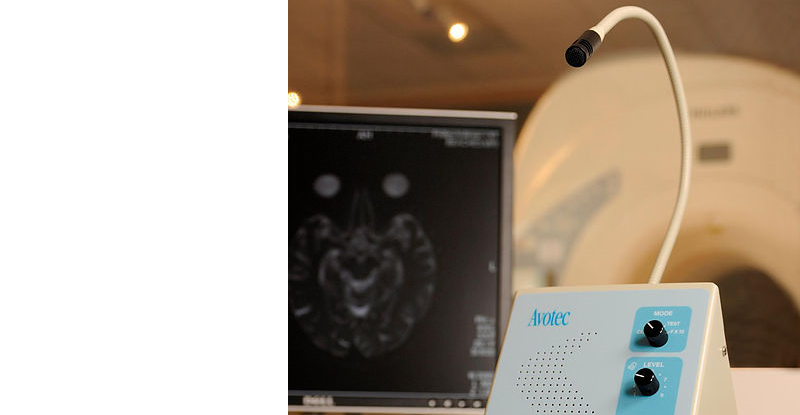 The SS-3300 system adds three fMRI specific features to Avotec’s SS-3000 system; mode selection, third octave (OTO) filter bank, and audio calibration. Four functional modes can be selected: clinical, functional, X10 gain, and test. In the clinical mode, the sound level output can be changed with the console volume control. In the functional mode, there is a fixed sound pressure level gain setting for the system, so the sound level output is effectively controlled by varying the input signal level; this allows for precise and repeatable sound pressure level settings .In the x10 input mode, a gain of 10 is applied to the input signal level; this feature is supplied to assist with the sometimes anemic outputs of computer sound cards. The test mode outputs a fixed gain, 1 KHz test tone that can be used for setting reference levels. The third octave (OTO) filter bank is factory adjusted to give a flat frequency response (+/- 4dB) across the operating range. This makes the design of your audio stimulation that much simpler. Additionally, the SS-3100 system is calibrated so you know what the SPL is as a function of input frequency and amplitude. Patient comfort starts with protection against gradient noise, the major complaint of MRI patients. Two different headsets mean flexibility in hearing protection choices; the full coverage headset fits most head coils, while the stethoscopic headset can be used for very confining coils. The new Scan-Lock Plus™ connector and tubing assembly makes changing headsets a quick and simple operation. MRI patients have great anxiety about their exams, and their ability to clearly communicate with you goes a long way towards relieving that stress. Silent Scan’s™ specially designed headsets have a built-in microphone channel that allows crystal clear communication between you and your patients. Yelling or repetition never occurs, because you and your patient will easily understand each other. 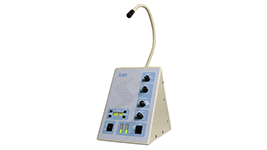 Silent Scan’s communication console has a flexible gooseneck microphone that is designed for the technologist’s comfort. 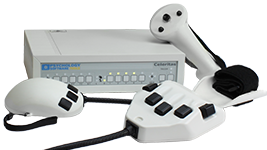 Since you no longer have to bend over to speak into an intercom, and the gooseneck microphone is always within easy reach, communication with your patients is effortless. 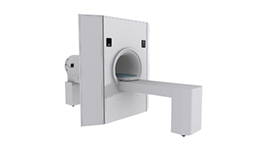 For your very claustrophobic patients, Silent Scan has a built-in patient alarm system. The alarm consists of a simple, hand held rubber squeeze bulb, that when actuated by your patient, triggers an audible alarm at the communication console. Just the existence of the alarm can be comforting, and its ability to alert you to a panicky patient is a great aid to both parties. The beneficial effects of music in reducing apprehension in MRI patients are well known. Music, when used as a comforting influence, can set the tone for the success of your patients’ visits. The Silent Scan™ headset allows your patient to relax to the music – free from gradient noise. 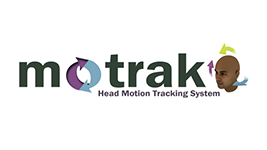 Careful matching of transducer characteristics and filter design in the Silent Scan system provides a remarkably clear music signal for the wearer of the headset. Because the headsets offer genuine hearing protection, the highest quality sound can be enjoyed at a comfortable listening level. Communication console with gooseneck microphone; AC power supply with power cord; transducer with mounting bracket; full coverage and stethoscopic headsets; sample packs of disposable headset covers and ear tips; DC power/signal cabling between console and transducer; RF filter for penetration panel connection; stereo system with AM/FM and CD; stereo patch cords; headset bracket; Scan-Lock™ Plus research tubing assembly; patient alarm bulb; alarm bulb bracket. Console, 7”Hx5”Wx 8”D, 3 lbs; AC power supply; transducer housing, 4”Hx6”Wx3”D, 13 oz. ; DC power cable (console cable plus magnet cable) per site specification, 200 feet (max); RF filter, 15-pin sub-D opening in pen panel required; stethoscopic headset 0.7 oz. ; full coverage headset 13 oz. ; tubing assembly, 19 oz. ; stereo (typical); Electrical (site specific): AC transformer 110VAC (50-60Hz)/220VAC (50Hz); fused FST 1A (115VAC)/FST 0.5A (220VAC). Frequency response (typical): Flat response (+/-) 4dB 200-4500Hz; time delay 9ms (nominal); non-dispersive acoustic propagation (constant phase delay). DC power/signal cables (4-shielded twisted pairs) in two sections (console to pen panel, and pen panel to transducer); RF filter, 15-pin sub-D; IEC power cord, plug type site specific, 3-wire grounded, 6 feet (nominal). housings, headsets, and connectors: white. one year warranty; optional three year extension.